Bradley Manning, the U.S. soldier accused of being the Wikileaks source, was kept in solitary confinement for eight months in a Marine brig at Quantico, Virginia. He was subjected to 24-hour surveillance and was forced to relinquish his clothing before bedding down for the night, then made to stand naked at roll call, his lawyers said. And in Atlanta, Ga., Judge Amanda F. Williams resigned on January 2 after being accused of acts of misconduct, among them jailing offenders in solitary confinement without access to lawyers. 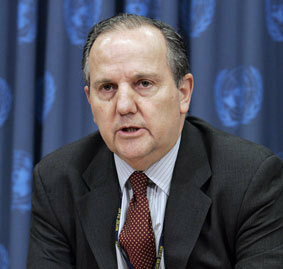 A lengthy solitary confinement can cause serious mental and physical damage and be considered torture, according to Juan Mendez, the United Nations rapporteur (investigator) into torture. And most countries in the world practice it. While Mendez did not concentrate on the United States (although he was denied a private interview with Manning), he knows something about the human cost of persecution. An Argentine lawyer, he was jailed for 18 months during the "Dirty War" in 1976, tortured with an electric prod and watched friends pulled from their cells and executed. He is now a visiting law professor at American University's Washington College of Law in D.C. Compared to the United States where public protests are possible, there are many countries where prisoners are lost, Mendez said. But he noted that few in the United States investigate what happens to locked-up foreigners in the name of ferreting out terrorism. Mendez has now added isolation in prison to his list of what constitutes torture. But he recognized there were cases where a prisoner needed to be protected from abuse by other inmates organized in gangs or out to get homosexuals. Among his worst examples, in a report to the U.N. General Assembly and a news conference in October, Mendez cited a woman in China, locked in solitary confinement for two years of an eight-year sentence for "unlawfully supplying State secrets or intelligence to entities outside China." "Solitary confinement is a harsh measure which may cause serious psychological and physiological adverse effects on individual regardless of their specific conditions." "It can amount to torture or cruel, inhuman and degrading treatment or punishment when used as a punishment, during pretrial detention, indefinitely or for a prolonged period, for persons with mental disabilities or juveniles," he said. But while solitary confinement is practiced in most countries in the world, studies show there are an estimated 20,000 and 25,000 individuals held in isolation in the United States. Human Rights Watch in its just-released World Report says that the United States incarcerates more people than any other country in the world, whether in jails in the United States or in Guantanamo Bay, Cuba, in what it called "abusive counterterrorism policies." The imprisoned population is 2.3 million, which amounts to 752 inmates per 100,000 residents, the world's highest per capita incarceration, HRW said. For a terrifying picture of how our prisons work, see journalist Alan Eisner's book, Gates of Injustice: The Crisis in America's Prisons, which among other details, take you inside prisons that deny human contact.